The Hostel Galia is situated in the heart of Brussels in the district of 'Marolles'. Just in front of the famous square of the legendary flea market (Place du jeu de balle) where bargain hunters, antique dealers and strollers mix. 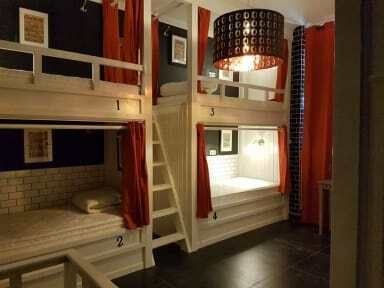 Hostel Galia is a stylish property ideal for young travellers. Free breakfast is served daily. Located in the area of the 'antiques dealers' , the hostel Galia is located near the famous Place du Sablon, Palais de Justice, the district of the museums, Grand Place and at 10 minutes (walking distance) of the Brussels Midi train Station. Perfect location for your stay in Brussels. Hostel Galia offers dorms and private rooms. The hostel has dorms up to 6 people (mixed, female and male dorms) all with private bathroom. The hostel has also private rooms, with double beds and private bathroom. Taxes not included - Local occupancy tax 4.24 euros per person per night. Harstikke leuk. 12 minuten lopen naar treinstation Bruxelles-Midi. Fijn dat er gordijntjes voor de bedden zijn voor wat meer privacy.